I want to talk about tech today. I don’t think I’ve ever written a post on tech, but this week I want to talk about the one piece of tech I cannot live without that is not my phone or laptop, both of which are essential in their own ways. No, what I’m talking about is headphones. They’re the way I experience almost all of the first listens to albums, get transported through stories in podcasts, and keep myself isolated from the world. The single piece of technology that allows me to be as effective as I am studying, writing, or researching is my Bose QC35s. I live by this single piece of technology every single day. I got them about a year and a half ago, and they have been the best times listening to anything in my life. I’ve tried Beats, I’ve tried Sennheiser, I’ve tried Audio Technica, I’ve tried everything. But these headphones somehow remain atop the very best I’ve ever used and definitely the greatest pair I’ve ever owned. The single most valuable part about a headphone for me personally is the comfort, and I have consistently worn these headphones for many, many hours. I’ve worn them for 22 hour flights to Ethiopia, for eight hour study sessions, and through the recent hour and a half commute to my internship, and I never feel like I need to take them off. They fit perfectly around my ears, and the seal they create is impeccable. They’re also wireless if you didn’t know, which allows for ultimate mobility. They also can be used powered plugged in as well, or without power using the included audio cable. But what sets these headphones apart is the noise cancelling. 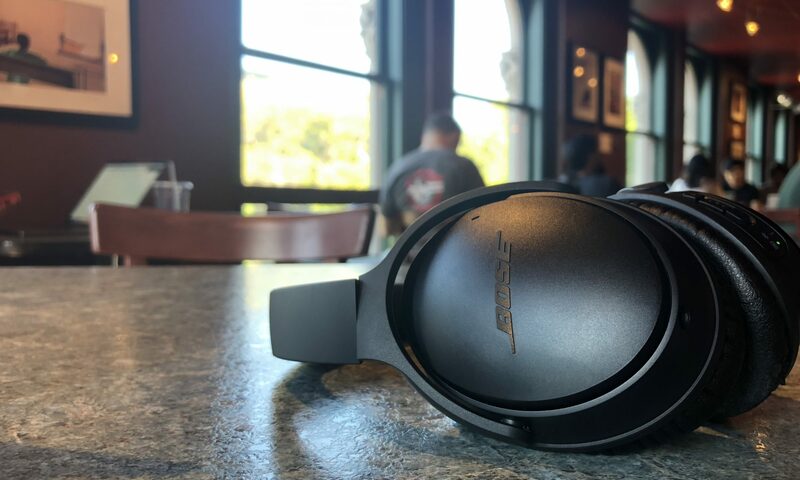 Now, anyone who loves headphones knows that Bose is the very best available when it comes to pure noise cancelling, and these are the very best Bose have ever made. When I want to tune out a busy coffeeshop as I am right now, I put them on. When I want to tune out my brother, I put them on. Sometimes I don’t even play anything through the headphones and just turn on the noise cancelling because it is that good at it. Within the app, called Bose Connect, you can actually toggle between full, low, or no noise cancelling, depending on the circumstances. I usually just leave it on the highest noise cancelling setting so I can listen to music at lower volumes and still not hurt my ears. Overall, the sound quality is solid. It definitely sounds clear for the most part, but it takes a higher volume, which I cannot listen to regularly, to hear how great these headphones are. They definitely are not the best in this class, as I’d argue that headphones by Sony are probably more balanced, but the bass here still packs a punch. Mids and highs are a bit muffled here, but they are still respectable. It definitely is tuned more towards hip-hop, but you can use a phone amplifier, or your respective audio listening apps to be able to correct for this. I haven’t mentioned any complaints yet, but there is one, albeit major frustration I have with these headphones: the ear cups. They’re very, very comfortable, but they are horrible quality. After only a year of use, the pleather begins to flake, and now I have a pair of headphones that lacks much of its original padding layer. I hate the fact that I have to replace them for $30, but I’m going to buy it anyways, so that’s that. The one thing that deters a lot of people from buying headphones that sound great is price. But if I’m going to be completely honest, for a gadget, a utility that you will use every single day, paying the extra money upfront for a great pair is absolutely worth it. The version I have, version I, is available for $330, but if you want to pay for the version II that has an “Action” button for noise cancelling toggle and Google Assistant, it’ll set you back $350. That is a price that many may be afraid of paying, and for good reason. But if you want to truly get a tool that you can use every single day, one with a $30 annual membership for a new set of ear pads, this is a worthy investment that you will not regret. I used to be a Bose fan, then was convinced Beats was better, Im going back to my roots now via the Bluetooth earbuds. Great post! Previous PostPrevious Being Noah Tesfaye #33: What Could the Released Harvard Admissions Info Mean?